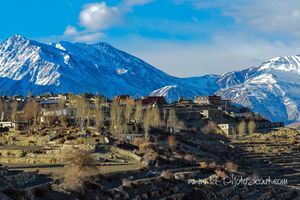 Nako (3600m) is a small village in Kinnaur, Himachal Pradesh, India. It lies in the sensitive restricted zone along the border with Tibet, which requires an Inner Line Permit to travel through. That, coupled with its remote location and limited tourist infrastructure, makes it a little-visited but rewarding destination. 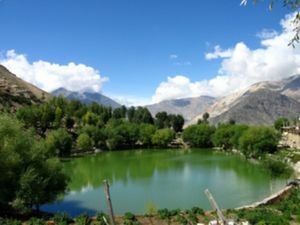 Nako (11'800ft)is located at the east end of Kinnaur Valley and is the last point of interest before you reach the landslide at Malling Nullah between Kinnaur and Spiti Valley. Catch a bus or 4wd to the landslide from Reckong Peo (4 hours), and tell the driver you're heading to Nako. If he isn't headed there himself then he will advise you on getting there. 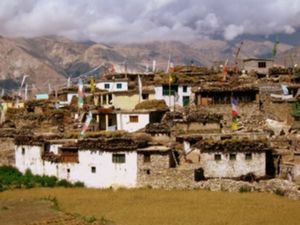 Nako lies within the restricted area close to the Tibetan border. An Inner Line Permit is required, which is available in Reckong Peo for Rs 150 or Kaza or Shimla for free, and is good for 14 days. It used to be prohibited to stay overnight anywhere within the restricted zone, but this is no longer the case, provided you have a valid permit. Also note that this Inner Line Permit is required only for Foreign Nationals and local people (including non-Himachalis)do not require same. If you've just crossed the landslide from Spiti Valley, ask around at Malling Nullah for a bus or car that can take you to Nako (45 min), or catch a Reckong Peo-bound bus that can drop you at the turn off to Nako and advise you on a connecting ride. Nako is tiny and walking is the only option. There are some nice day walks around the mountains if you're reasonably fit. Behind the lake you can head up the mountain towards the visible chortens which is a nice viewpoint. If you still have a lot more energy continue around to the other side of the range for views east towards Tibet. In 3 to 4 hours you can reach the village of Tashigang perched high above the Sutlej valley, with an interesting temple. The only things you'll encounter underway are sheephearders and great views. There isn't much to buy except snacks for some day hikes. Bottled water is available. During the tourist season there are some souvenir stacks with clothes and Tibetan Buddhist artefacts. A few local dhabas serve very basic local food such as momos, chowmein, or rice & dal. Reo Purgil has a little more variety and caters more to foreign tastes. There are only 3 options for visitors, and unfortunately they're all at the entrance of the town on the road. With luck and time some of the locals may start some homestays, but for now it is not possible. Nako Knaygoh Kinner Camp. edit Is the quality Accommodation in the town overlooking the lake having 11 tents with attached bathroom and 4 Guest House room, tents are new and carpeted and geared to provide guest comfort at high altitude in windy and cold conditions. In addition to this there is a restaurant as well that serves Indian, continental and local cuisine. Power cuts are a regular feature of days in Naco however the altitude keeps the place cool and comfortable in summers .Also the mobile network is poor and hence connectivity is limited or none at all. Visitors are cautioned to keep these facts in mind and visit the place for a gadge free experience . Always walk clock-wise around temples and chortens, and keep your right side facing them. Don't touch them with your left hand. Nako doesn't see much tourist traffic so tread lightly and be discreet and polite. 1 or 2 buses a day leave from here and can take you to the landslide at Mulling Nullah (45 min) if you're headed for Lahaul and Spiti, or to Reckong Peo (4-5 hours). Times can be sporadic so enquire locally. There are also a handful of 4wd's, some working as shared taxis (slightly more costly than a bus) and some available for private hire. This page was last edited on 24 September 2018, at 14:19.